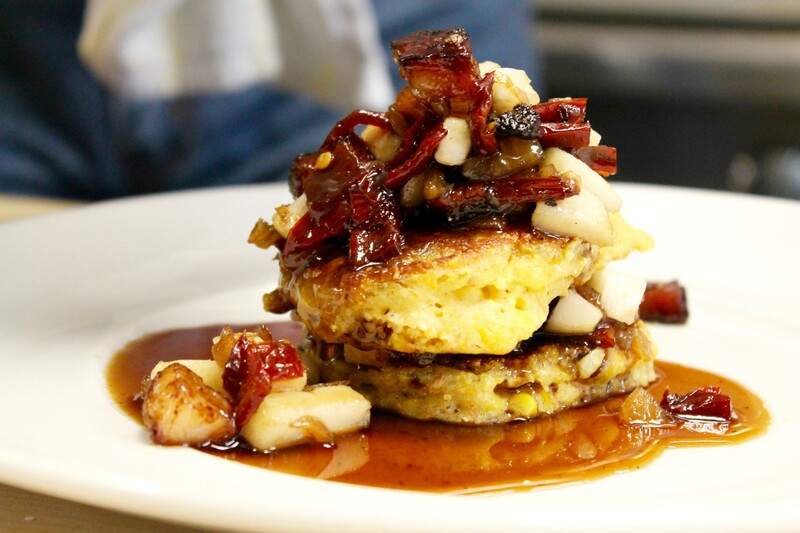 Florida may not be known for its maple syrup, but that’s where the inspiration for our balsamic-syrup-drizzled hoecakes began. Our good friends, and frequent inn guests, called us one night raving about a blue corn appetizer they had in Fort Lauderdale. They excitedly shared the dish’s balsamic and maple notes. What would elevate this dish? We all agreed – real, quality Vermont maple syrup. With a recent trip to South Carolina on our minds, corn also had an obvious appeal to the southern flavors still lingering on our tastebuds. Intrigued and inspired, we began thinking of how to use both corn and maple in our own recipe for the inn’s breakfast. 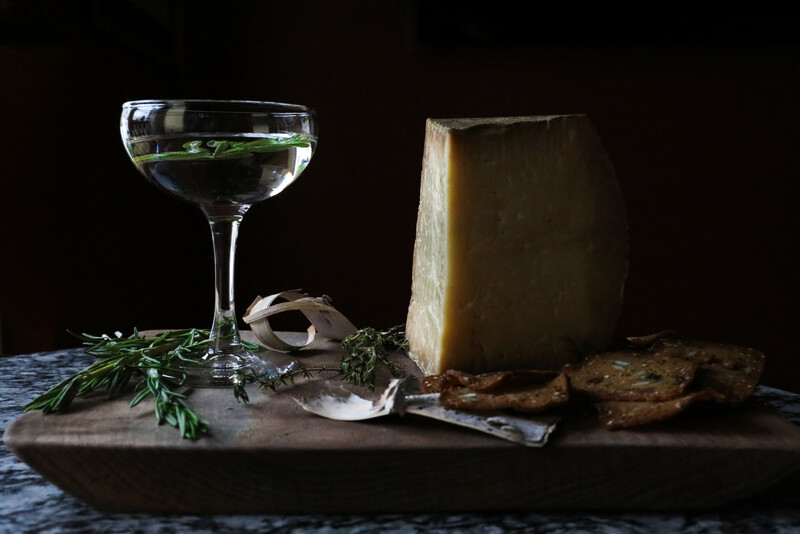 Incorporating these ingredients into a well-balanced dish presented a challenge. After much trial and error, the Jackson House hoecake was born. The finished recipe is the closest to a traditional breakfast you’ll find at the Jackson House Inn. 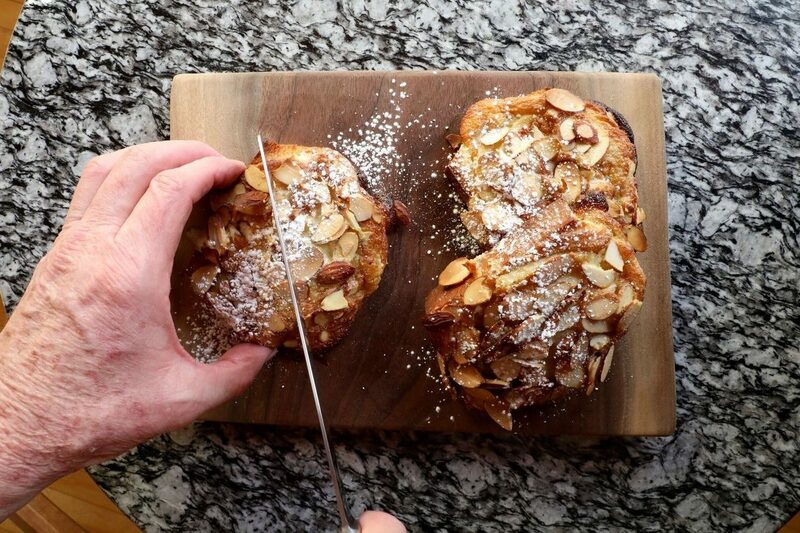 While you’ll rarely see conventional french toast or waffles on our breakfast tables, our guests have fallen in love with this sweet and salty twist on classic pancakes. 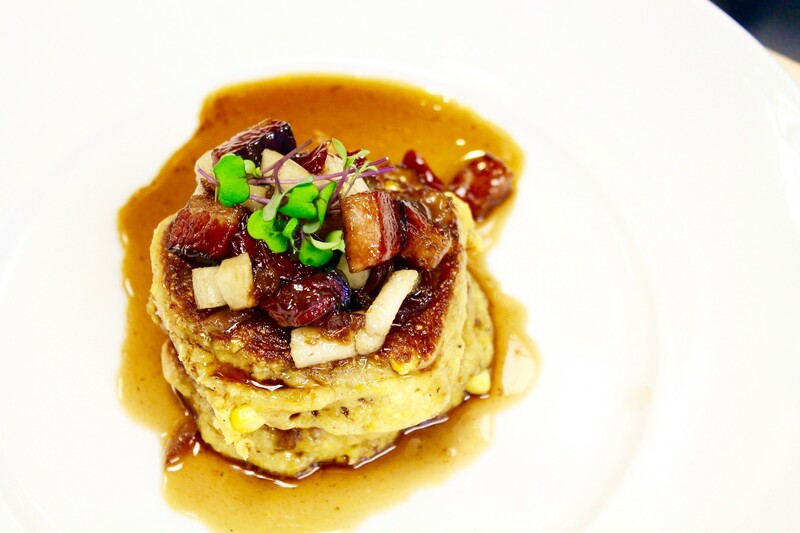 Hoecakes are in fact an unleavened cornbread cake with crisped round edges and a golden hue. The name derives from the American cooking folklore of field hands cooking corn cakes on their hoes. While this seems nearly impossible, “hoe” was actually a colloquial term for “griddle” – commonly used for baking cakes since the 1600s. Cornmeal’s dense and earthy taste once gave its batter a bad rap. Colonists saw this ingredient as a stubborn substitute for wheat flour. Over time, however, cornmeal has become a thing of national pride, with recipes evolving to create light, fluffy, and sweet variations. We’re committed to using the best local ingredients possible in our hoecake recipe, the most notable of which is buttermilk from Animal Farm in Orwell, Vermont. Animal Farm provides butter exclusively to Thomas Keller, as well as No. 9 Park in Boston. Old world and hand churned, it’s no surprise that this butter is treated like the holy grail of sought after dairy. This butter is not available to most. However, we found a way to purchase the very next best thing – Animal Farm’s buttermilk. The clean, natural tang of this buttermilk, combined with the lightness of creme fraiche, truly make for a subtle, yet complex, batter. The stoneground organic cornmeal used in our recipe comes from Butterworks Farm in Westfield, Vermont. Freshly shucked and straight from the farm, we acquire our corn cobs from various local farmers as well. Both meal and kernels work to create a flavorful batter and rustic texture that scream fresh corn. Complimented by sweet maple, savory tomatoes, and house smoked bacon, our hoecakes allow for a multi-layered tasting experience that highlights the purity of each individual ingredient. If you’re more keen on fruits other than pears, you can adapt the recipe with various fruits of your choice. We’ve used peaches during the summer season. We also suggest using maple syrup from Brookfield Sugarmakers, produced by farmers who take a horse-drawn sleigh to gather the sap collected in traditional buckets. It’s all about the old school method here. An open fire pit boils the sap down to create a whisper of smokiness. This is a delicious ingredient that is sure to reform your hoecakes in true Vermont fashion. Sift flour, baking powder, and baking soda into a mixing bowl. Add cornmeal, salt, and pepper. Thoroughly mix with a wire whisk, so that all ingredients are well incorporated. We suggest at least 2 minutes of whisking for even blending. Reserve. Warm a sauté pan over medium heat. While heating, shuck fresh organic corn. Cut the kernels off the cob into a bowl. Add 4 tablespoons of butter to sauté pan and quickly add the kernels. Sauté for approximately 2 minutes (since the corn is super fresh, this is all the heat you need). Let corn cool in pan for 10 minutes. In a blender, add buttermilk, creme fraiche, and shallots. Blend on low speed until just combined. Then add approximately 1 1/4 cup of corn and blend again on low speed (the blender will lightly shred the corn and release the natural corn milk). Finally, add the eggs and blend on low until just incorporated (so not to create any air). Pour corn batter into a well in the middle of the dry mixture. Mix until you don’t see any dry flour or cornmeal bits. Add the remaining whole corn kernels and fold into batter. 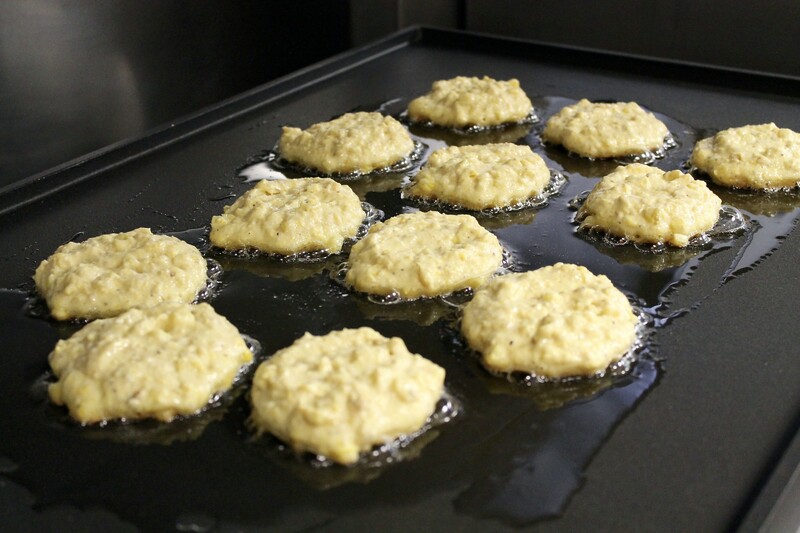 Allow the hoecake batter to hydrate in the fridge for a minimum of 30-45 minutes. Prep accompaniments while cooling. 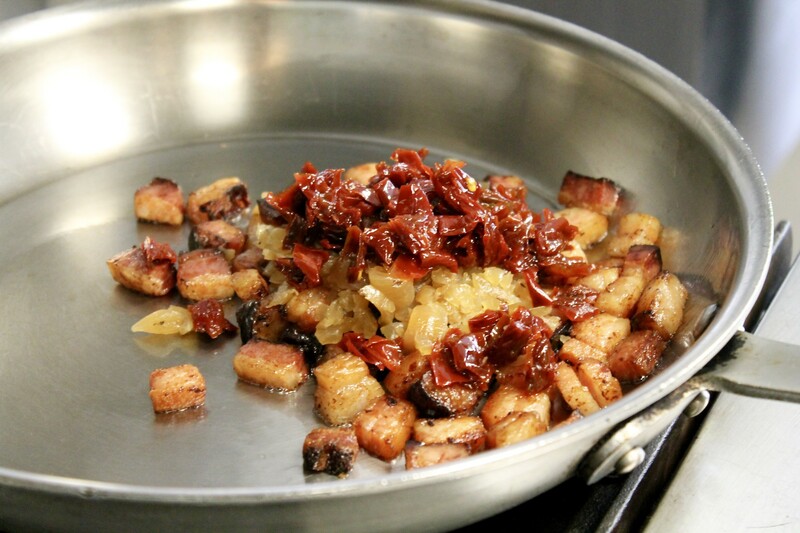 Dice the bacon into 1/2 cubes and sauté over medium heat until a fair amount of the fat has been rendered and just before crisping (the slight chew and natural smokiness of the bacon should shine through). Reserve 2 tablespoons of fat. Clean mushroom caps and place into a hot pan. 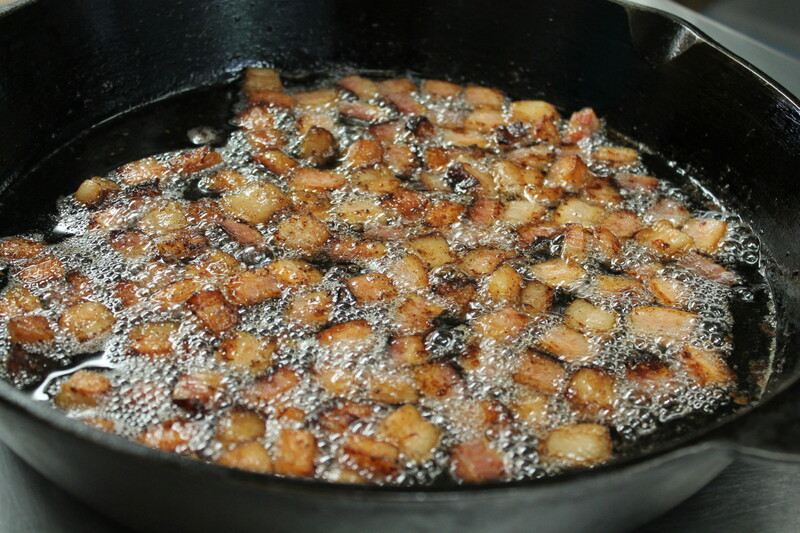 Sauté in reserved bacon fat for 2-3 minutes on each side, just until the mushroom releases its moisture. Resist stirring the mushrooms, and let them cook undisturbed in the pan. Let cool for 10 minutes and slice into 1/8 inch segments. Peel, core, and quarter pear. Slice into 1/8 in segments. Finely dice shallots. 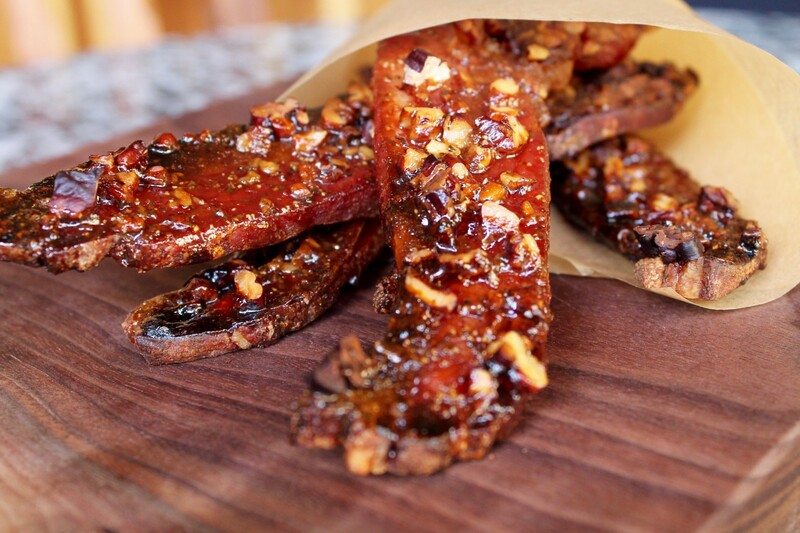 Julienne sundried tomatoes into 1/8 inch strips. In small greased pan or iron skillet, melt 1/2 tablespoon of butter. Spoon 2 tablespoons of batter per hoecake on surface. Cook over medium heat (375 degrees) for approximately 4 1/2 minutes on the first side. Flip, check for browning, and cook for approximately 3 minutes on the second side. The edges should be nicely browned and crip. The inside should be slightly firm and a touch tender. While hoecakes are cooking, reheat bacon over medium heat for 2 minutes, add shallots and sauté until just translucent. Then add sundried tomatoes and mushrooms. Lightly sauté for 30 seconds. Drizzle the balsamic and allow slight evaporation of the vinegar to occur 30 seconds before adding the maple syrup. Swirl pan to incorporate all ingredients. Add pear segments and swirl pan once more to just slightly warm the pear. 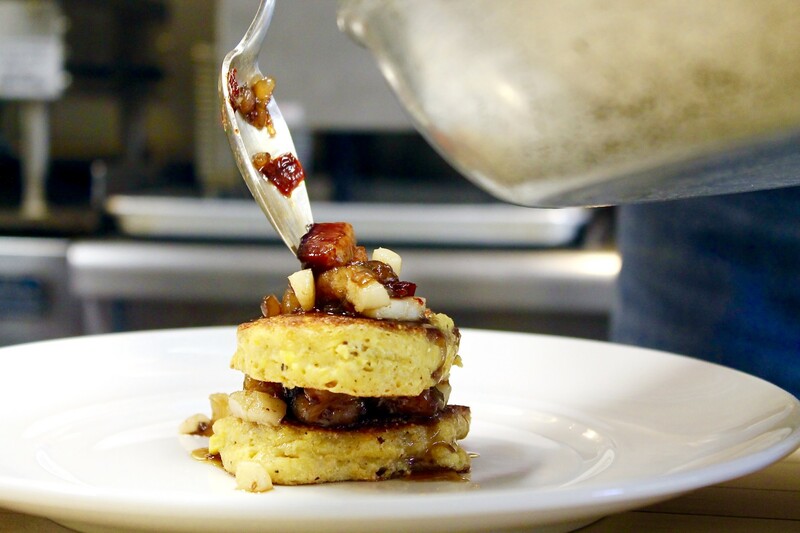 Place one hoecake on plate and top with desired amount of balsamic maple mixture. Place second hoecake and top with desired quantity of balsamic maple mixture once again. Drizzle with liquid from the mixture. Garnish with microgreens. Serve immediately and enjoy.